Did you ever need a gift for someone who's crafty and likes to create things themselves? 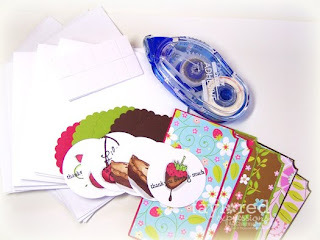 When I'm thinking about gifts for someone who makes cards themselves or likes to do crafts, I feel like a pre-made card set is boring. I'm sure they'd appreciate it anyway, but I like to change things up a bit. 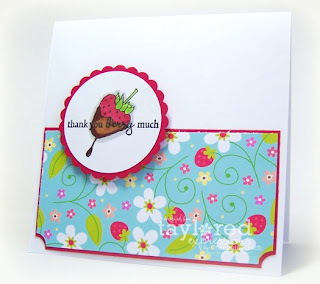 The project I have to share with you today has all the pieces for the recipient to put together their own card set! 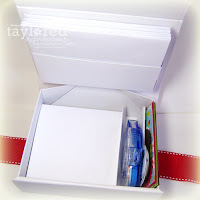 I've started off with one of the Perfect Package Card Boxes from Taylored Expressions. These make the packaging so easy! 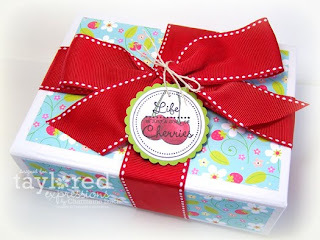 All I did was add some patterned paper to the top and sides of the box and wrap it with a BIG bow! Here's what a finished card looks like. Of course, the recipient can make it "their" way and even add things (like ribbon or other embellishments) that weren't included in the package. If not, the cards are simple and cute as is. The envelopes didn't fit in the bottom of the box because of the little "divider" I created, so I made a little pocket on the lid to hold them! For the divider, I took an 8"x 4 1/2" piece of white cardstock and scored the 8" side at 4 1/2", 5 5/8" and 6 7/8". "Mountain and valley" the folds and add some adhesive to the inside of the "mountain" to make the divider and insert into the box. For the envelope pocket I took a 10 3/4" x 3" piece of cardstock and scored the 10 3/4" side at 2" and 2 1/2" from each end, then score one end of the 3" side at 1/2". Fold on all score lines, cut tabs and remove end squares from 1/2" section and adhere pocket to lid. 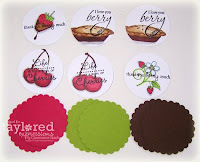 This is such a cool idea Charmaine! The pocket for envelopes is simply brilliant!!! This is so awesome CHarmaine! What a great gift idea! I would LOVE to make something like this and receive it!!!! You SO rock Ms. C!!!! This is PURE GENIUS Charmaine! LOVE that you included the adhesive and the band holding the envies is fab too! This rocks! This is so gorgeous! I love your blog, so inspiring! Super cute and wonderful gift - but that pocket fo the envelope - that is genuius! Wow! That is amazing. I need me some of those boxes. Thanks for the tut as well. sure to "hit a home run" with this gift! I better get busy! LOL! Thans for sharing!